I have decided to go a different way with my Game of Thrones recaps. I just feel like they will end up taking a lot of time to write up, being that there is a million and 1 characters per episode (really hard to spell too), so I figured I’d give you guys a quicker recap with pictures and short details. George R.R. Martin, I swear the man makes recapping difficult lol. This past Sunday was the highly anticipated premiere of Season 4. I feel like we have been waiting forever for this to happen. Alright, let’s get this party started. Jamie is back in King’s Landing and Cersei is not very happy about his shortcomings. Neither is his father, who believes he is useless without his right arm. Ohhh snap… they got him! We were introduced to Prince Oberyn Martell, who comes to King’s Landing to attend the royal wedding in place of his brother Prince Doran. He wastes no time and goes down for some fun at Littlefinger’s brothel where he picks out a man of his liking for some fun. 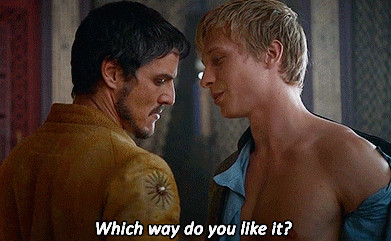 Ummm.. yeah… only GOT can get away with this. Tyrion tries to resist Shae’s temptations because he has been busy trying to keep Sancer happy. She’s uber depressed, duh, her whole family is gone. Tyrion is also contending with Oberyn and his crew, who by the way totally want to kill every Lannister out there. Daenerys Targaryen’s dragons are getting bigger and she is starting to realize how difficult they are to tame, as they fierce creatures even for her. Regardless, they are her babies. Jon Snow is on trial for his misgivings, but he has info about the Wildlings and he warns them that they are coming and this time around they have more recruits. They let him off and Jon walks away with more swagger than Jay Z.
I saved the best for last of course. Arya and the Hound are still wandering together, they spot Polliver, the guy who had killed one of her friends and is carrying her sword and she wants it back. What this girl wants, she gets! Of course the Hound helps her out and they recover it in a great battle scene at a greasy tavern. Who wants some chicken? And then there’s this… AWWWWWWWWWWWWWWWWW!!!!!!!!!!!!! Good stuff, short but sweet and bloody! I know me too right every single time I have another funny pic like that I’ll have to show u ! I wasn’t loving the episode but then that ending made me realise why I love GOT! Of course they always come through right! Hi Melissa! I don’t watch GoT but I’ve been reading lots of posts on it that I felt like I did, ahah. 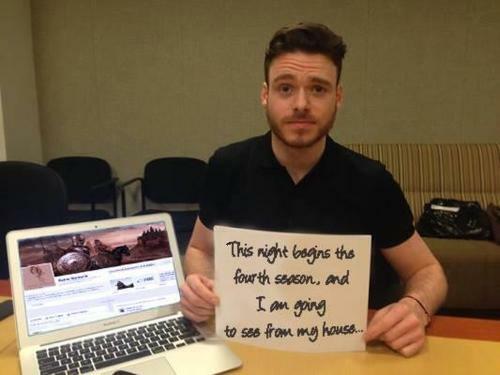 Awww what a cute photo of Richard Madden, that man is adorable! I know he is adorbs! You should watch it!! Its like watching a really long good movie every season. I just might when it’s on Netflix 🙂 But generally I don’t do well w/ extreme violence, that’s why I’ve been avoiding it. OHHHHHHHHHHH hmmmm well then maybe you shouldn’t watch. 😦 A lot of that happens on this show. Just like the motion pictures in the post….